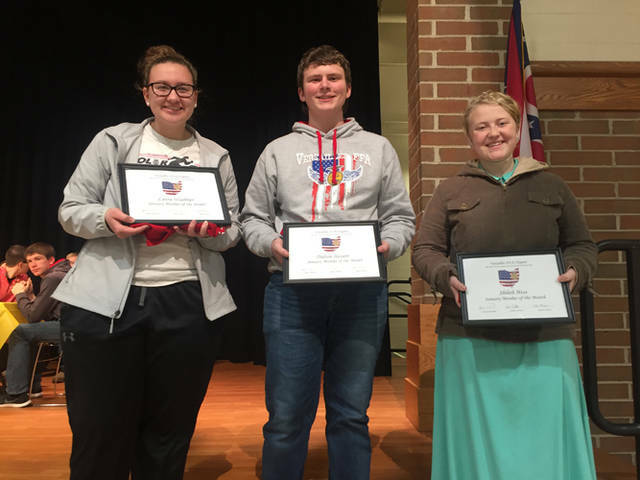 VERSAILLES – Three dedicated members – Shiloh Hess, Dalton Hesson and Laura Wuebker – were recognized at the Versailles FFA meeting on Jan. 14. The first member recognized was Hess. She is the daughter of Marcus and Rosanna Hess. She has participated in Ag Issues, Food Science and Horse Judging CDEs. She has been actively involved in the Color Run and Health Fair, Fall Harvest Sale, Greenhand Conference, CDE Recognition Luncheon, Farm Day, Blanket the World, FFA banquet, fruit sales and numerous other activities. Her SAE consist of growing a garden as well as formerly working at Nature’s Reflection. Hess received a FFA T-shirt and certificate for being recognized as a member of the month. The second member we recognized was Dalton Hesson. He is the son of Doug and Sherry Hesson. He has participated in the Parliamentary Procedure, Wildlife, Greenhand Quiz, Public Speaking, Job Interview and currently is doing ag sales CDE. He also has been actively involved in the National FFA Convention, Greenhand Conference, CDE Recognition Luncheon, state convention, banquet, Farm Day, fruit sales, recreation, showing at the Darke County Fair and many others. His SAE consists of market rabbits and working at Greenville Ace Hardware. Hesson received a FFA T-shirt and certificate for being recognized as a member of the month. The final member recognized was Laura Wuebker. She is the daughter of Jeff and Dena Wuebker. She has participated in Parliamentary Procedure, Dairy Foods and currently is doing ag sales CDEs. She has been actively involved in the can food drive, nursing home visits, Thank A Farmer Meals, Color Run, EMT Firefighter Safety Training, trash pick up, Fall Harvest Sale, Pork and Beef Tent at the Darke County Fair, Shop and Crop, Poultry Days Ag Awareness, delivering canned food, shopping for Adopt A Family, fruit sales, Veterans Program, Greenhand Conference and numerous other activities. Her SAE consist of showing dairy steers at the Darke County Fair. Wuebker received a FFA T-shirt and certificate for being recognized as a member of the month.